Bits and Pieces...: CHA Bound! Yay! Today is the day! I'm heading to the airport after work this afternoon and I'm so excited. Can't wait to spend time with my girls from Emma's and to shop for the store. I'm going to miss my two guys, but I know they'll be fine as they have each other. Daddy has planned some fun 'bonding' time activities! I've scheduled a couple of posts over the next few days. I have some Tattered Angels goodies to share with you. I love the new releases. There are so many beautiful new products. This first project is a layout that I did using the new Travel line. I paired it with some Prima paper and a bingo card from the travel line. I used several new colors on this page: I sprayed the corner and compass chipboard with Popsicle and Viva Pink and the Adventure piece with Hula Hoop. I added ink to both of them. I love the new Glimmer Glass. It's not tinted anymore and has blasck outlines. 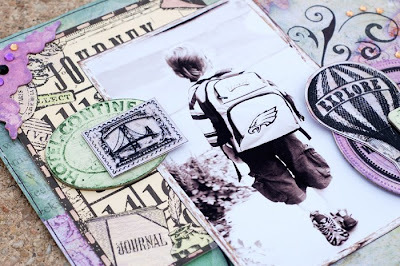 I backed my pieces with patterned paper, but you can also mist or paint it. Gorgeous!! Have a great time at CHA! 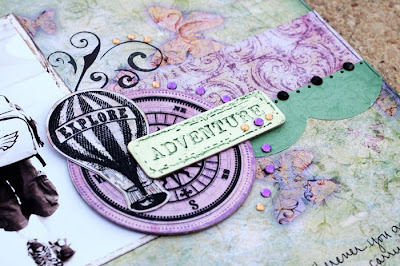 Beautiful paper and love the hot air balloons! Have a wonderful time at CHA! Beautiful layout! I love that colour combo, it's one I haven't used before. This is GORGEOUS!!!!! LOVE the colors! Have fun at CHA! WOHOO!!! Have fun at CHA! Wish I was going, but I'll be back for Chicago this Summer!!! Loving your new projects~!!! Hope you have a fabulous time at CHA, Anabelle! And I love your layout! Such great splashes of color, and such a cool photo treatment. I just got some of their bingo cards yesterday, and am feeling totally inspired to play!